Damn, I wish we would have/could have won this game. 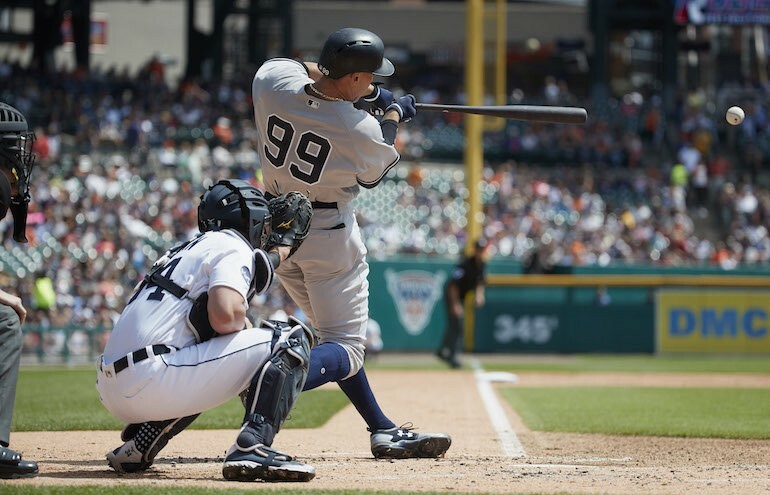 It left a very bad taste on Getaway Day as the Yankees fell to the Detroit Tigers in a fight-marred game. I can’t say that I’ve seen too many games where the manager and his replacement are both tossed at different points of the game. It was a back and forth game until the Tigers finally pulled away in the latter stages of the game after several skirmishes. The Tigers scored first in the bottom of the 1st when Justin Upton took Yankees starter Jaime Garcia deep with a solo blast to left. Upton got all of it with the barrel of his bat and you knew it was gone by simply the sound. I’ve tried to give Garcia every benefit of the doubt but I am starting to believe that the Minnesota Twins traded Garcia to the Yanks a week after they had acquired him because they wanted a way to make up ground on the Yankees. Aaron Judge led off the 2nd inning with a single to center. He advanced to second on a wild pitch in the dirt by Tigers starter Michael Fulmer. Didi Gregorius grounded out to the second baseman, Ian Kinsler, with the relay to first. Judge moved over to third. He was brought home when Chase Headley punched a single to left. The game was tied at 1. The Tigers loaded the bases with two outs in the bottom of the 3rd but Garcia was able to get out of the inning when Miguel Cabrera lined out to right. Gary Sanchez led off the 4th inning with his 27th home run of the season, a shot to center. Tigers center fielder JaCoby Jones could only watch as the ball sailed over the fence. The homer was El Gary’s fourth of the series. The Yankees had taken a 2-1 lead, but the Tigers came right back in the bottom of the inning to tie it. Nicholas Castanellos led off with a double to center in the gap as center fielder Aaron HIcks was in right center due to a shift. Castanellos moved to third on a fly out to left by James McCann, easily beating the throw from Brett Gardner. John Hicks got a hit through the infield on the left side which brought Castanellos home. The game was tied. The Yankees jumped ahead in the 5th inning. Ronald Torreyes led off and reached base on a fielding error by second baseman Ian Kinsler. The ball rolled past the pitcher and Kinsler attempted to make the play but bobbled it. Toe moved to second on a ground out by Austin Romine. The grounder rolled up on the shortstop, Jose Iglesias, so his only play was at first. Brett Gardner singled to deep short, with Toe moving to third (wisely holding up). A sacrifice fly to center by A-A-Ron Hicks scored Toe. The Yankees led, 3-2. The incident that probably sparked the later fights occurred with the next batter when Michael Fulmer hit Gary Sanchez in the hip. I honestly couldn’t tell if Fulmer’s pitch was intentional or not. Fulmer’s reaction seemed to imply that it was not. The HBP moved Gardy into scoring position, but the Yankees couldn’t capitalize when Aaron Judge went down swinging to end the inning. The Tigers tied the game again in the bottom of the 5th. Mikie Mahtook led off and reached first base on a fielding error by Didi Gregorius (a routine grounder that rolled under Didi’s glove; this one hurt as it would open the door for the Tigers). Justin Upton doubled down the left field line, pushing Mahtook to third. Jaime Garcia was mercifully pulled from the game (don’t let the door hit you on the way out) and replaced by Adam Warren. Sadly, Warren was about as effective as Garcia. He struck out the first batter he faced, Miguel Cabrera, but then Nicholas Castanellos hit a fly ball to center, deep enough for Mahtook to tag and score. Upton took third. The game was again tied. Walks to James McCann and John Hicks loaded the bases. After a visit to the mound by pitching coach Larry Rothschild, JaCoby Jones singled to right, a liner just over Ronald Torreyes’ head, scoring both McCann and Hicks. Jose Iglesias followed with a ground-rule double to left center (a one-hopper over the wall) to score Hicks. It was 6-3 Tigers. Tommy Kahnle replaced Warren and struck out Ian Kinsler to get out of the inning. Tempers were ignited in the 6th inning. With two outs in the bottom of the 6th, Tommy Kahnle threw behind MIguel Cabrera and was immediately ejected. 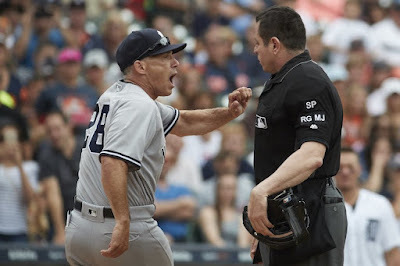 It brought out a furious Joe Girardi and he was tossed. Girardi’s beef was that there was no warning from the umpiring crew after Gary Sanchez was hit by Fulmer. Aroldis Chapman warmed up and entered the game. As Miguel Cabrera walked back into the batter’s box, he was running at the mouth with words directed at catcher Austin Romine. Romine flipped off the catcher’s mask and Cabrera shoved him, clearing both benches. After things started settling down, it was interesting to see Romine’s brother Andrew over getting the story from Austin. 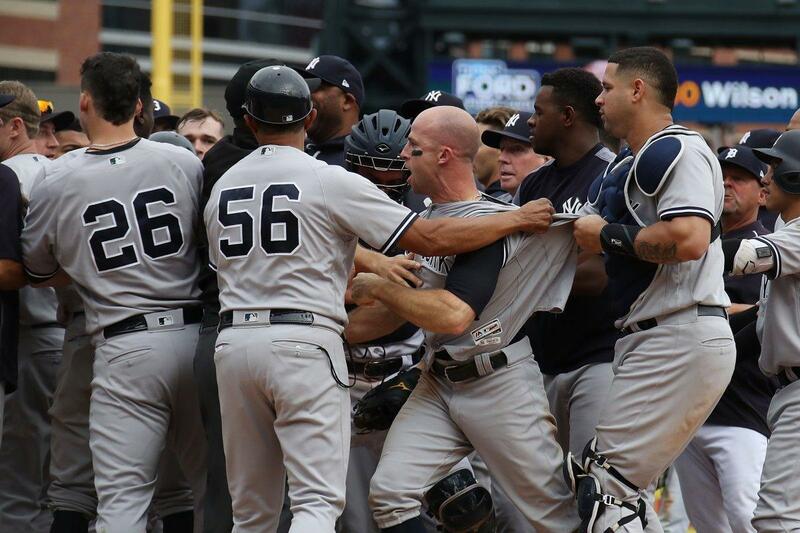 It seemed to me that the melee was incited by Cabrera. The umps tossed Austin and Cabrera. The move forced the Yankees to forfeit the DH when Gary Sanchez was moved to catcher. In a valiant comeback attempt, the Yankees tied the game again in the top of the 7th. Ronald Torreyes led off with a walk. Jacoby Ellsbury, pinch-hitting for Aroldis Chapman, also walked. The Tigers pulled Micheal Fulmer and replaced him with Daniel Stumpf. With Brett Gardner at the plate, a wild pitch by Stumpf that got away from James McCann allowed Toe and Ellsbury to move to second and third. Gardy then singled to center with a fly that just dropped in, scoring Toe and moving Ells to third. A sacrifice fly to the left field wall by Aaron Hicks scored Ellsbury. The Tigers made another pitching change to bring in Alex Wilson. Gary Sanchez greeted Wilson with a single up the middle to center field and Gardy scored to tie the game at 6. 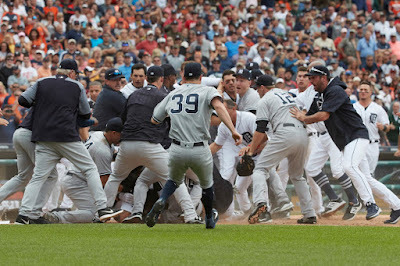 Dellin Betances took over in the bottom of the 7th and he was ejected when he threw a ball that hit James McCann in the head. That was not pretty. I was glad to see that McCann was okay. I think the ball got away from Betances. I don’t think he was purposely head-hunting. Plus, it didn’t make sense to hit a batter in that spot. Game tied, no outs. Yankees bench coach Rob Thomson, the interim manager when Girardi was ejected, was also thrown out for arguing. David Robertson replaced Betances and hit John Hicks on the hand with an unintentional pitch. JaCoby Jones walked to load the bases. Jose Iglesias doubled to left center over Brett Gardner’s head, clearing the bases. The Tigers had re-taken the lead, 9-6. In a retaliatory move, Alex Wilson plunked Todd Frazier (hip) in the top of the 8th. The benches were cleared a second time. Brett Gardner was the one who had to be pulled out of the crowd, kicking and screaming. Both Wilson and Tigers manager Brad Ausmus were ejected. Shane Greene entered the game and shut the Yankees down from there. In the bottom of the 8th with Caleb Smith on the mound, James McCann got a measure of revenge when he took Smith deep for a solo blast high over the wall in left center. Brett Gardner led off the top of the 9th with a single to right off Greene, but Aaron Hicks grounded into a double play. Gary Sanchez ended the game by striking out on a foul tip. A tough loss, particularly the way it went down. The Yankees (68-58), fortunately, did not lose any ground in the AL East and remain 4 games back. The Cleveland Indians apparently solved the Chris Sale mystery as they bludgeoned the Boston Red Sox, 13-6. The Tampa Bay Rays beat the Toronto Blue Jays, 2-0, to move into a third place tie with the idle Baltimore Orioles. Both teams are 6 1/2 games behind the Yankees. There were no heroes in this game. The umpiring crew was a joke. They let the game get out of control. 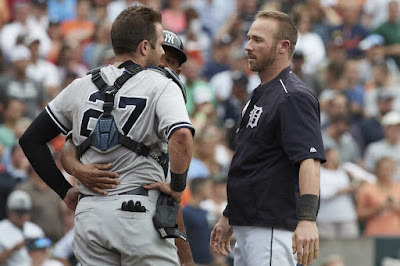 There was even a scuffle in the Tigers’ dugout when Victor Martinez had to be restrained from going after Justin Verlander after the two exchanged words. Yankees third base coach Joe Espada finished up the game as manager after Rob Thomson was thrown out. The Yankees return home to host the Mariners for Players Weekend. It should be fun with the relaxed uniform standards and player names or nicknames on the jerseys. 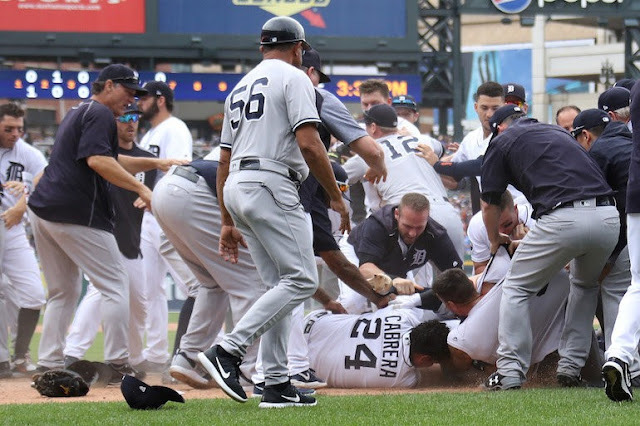 Hopefully the Yankees can shake off Thursday’s brawl and return to the winning ways they experienced in taking the first two games from the Detroit Tigers. It’s unclear if Robinson Cano will play this series. 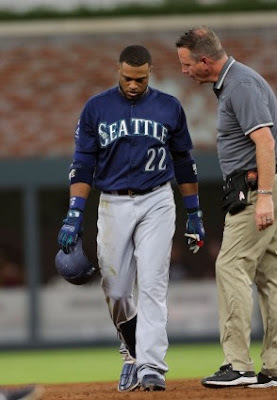 Don’t You Know was pulled from a game on Wednesday with hamstring tightness and was scheduled for tests yesterday. At the present time, he’s listed day-to-day. The Mariners are currently tied for third in the Wild Card Standings with the Kansas City Royals and Los Angeles Angels. They trail the Yankees by four games and the second WC team, the Minnesota Twins, by just a 1/2 game. Have a great Friday! Back home and time to take care of business. Let's Go Yankees! Was never n favor of this trade. Your sending a high ERA pitcher in to the AL East and that is never good. Should had kept Montgomery in the rotation then you could leave him off the playoff roster because of innings limit. Sometimes Cashman gets snooked see Drew trade.